EOS Foundation Study on Women's Power Gap in Higher Education ranks percentage of women enrolled and women represented in executive roles, senior leadership and board. Cambridge College has been ranked #11 out of 93 on a spectrum of progress on gender parity in Massachusetts institutions of higher education. The College received a “Satisfactory” rating, indicating top marks in categories of women enrolled and leadership structure across the president, senior team, and board. 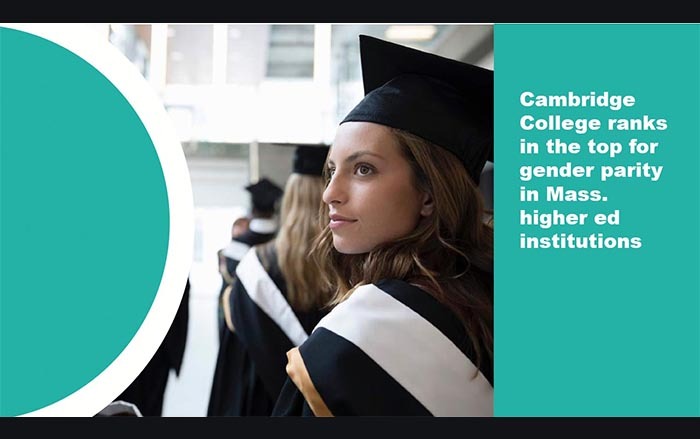 Of the 18 schools that received a satisfactory rating, Cambridge College was one of five top institutions that have reached gender parity. The report also highlighted that President Jackson is one of only five women of color among the 94 presidents represented in the study. Moreover, women comprise 50% of the most highly compensated professionals at Cambridge College. The EOS Foundation undertook this first-of-its-kind study to determine who is leading on gender and racial balance among Massachusetts institutions of higher education and who is falling behind. Women represent 57% of all students at these institutions and are earning the majority of doctoral degrees, yet they hold only 31% of all presidencies. The report sought to determine why such gender disparity in leadership exist in a field where women have been excelling for decades.